Many technical journalists, communicators and translators show a tendency to use noun forms in preference to verb forms, for example 'acquisition' in preference to 'acquire'. This gives rise to much discussion. Today, I do not wish to add to the theoretical discussion, but merely to quote some examples then add a few brief comments. 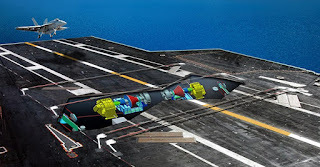 The article discusses the General Atomics-built Advanced Arresting Gear under development for the U.S. Navy's next-generation Gerald R. Ford-class (CVN-78) aircraft carriers. “The Advanced Arresting Gear has become a model for how not to do acquisition of needed technology,” a senior Navy official told USNI News on Tuesday. Question: Why 'how not to do acquisition' rather than, say 'how not to acquire'? 1) While most style guides suggest that verbs are preferable to nouns, this general rule is often flouted by technical communicators, particularly when the noun carries connotations that the cognate verb does not. 2) When understood as shorthand for 'defense acquisition', the noun brings to mind university courses, guidebooks and more. [The Defense Acquisition University provides mandatory, assignment specific, and continuing education courses for military and civilian personnel. DAU guidebooks here.] The verb 'acquire' carries none of this mass of information, know-how, procedures, constraints, etc. If anyone out there in the blogosphere knows of a a more thorough treatment of this topic, please let me know. Question: Why 'aircraft that can make an arrested landing'? 1) First, I assume that the author meant to write 'aircraft that can make an arrested landing'. 2) This example is grammatically different from the one above. Here the challenge is to find a verb form combing 'to land' and arresting gear. ... But now, having isolated the problem, I'd suggest that the author might have done better to write 'expand the types of aircraft that can land on carriers using arresting gear'. While there are clearly cases where technical journalism demands certain noun forms rather then the cognate verb forms, frequent recourse to noun forms in preference to verb forms can result in poor style.